Reishi – Ganoderma lucidum plug spawn for Logs & Stumps. 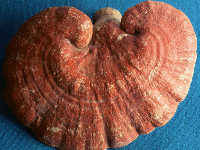 The Reishi mushroom can increase the production of interleukin1 and 2, resulting in inhibition of tumor growth. Studies show that Reishi can have a number of other positive effects on the body such as analgesic, anti-inflammatory, antioxidant, anti-viral (through its interferon production), lowers blood pressure. It also acts as a cardio tonic by lowering serum and increasing the production of interleukin 1 and 2, which results in inhibition of tumor cholesterol, expectorant, anti-tissue, liver protecting and detoxifying, protection against ionizing radiation, antibacterial, and anti-HIV activity.